Over the past few weeks, Team Neutrino has been working on a robot to compete in FIRST’s 2019 game, DESTINATION: DEEP SPACE. 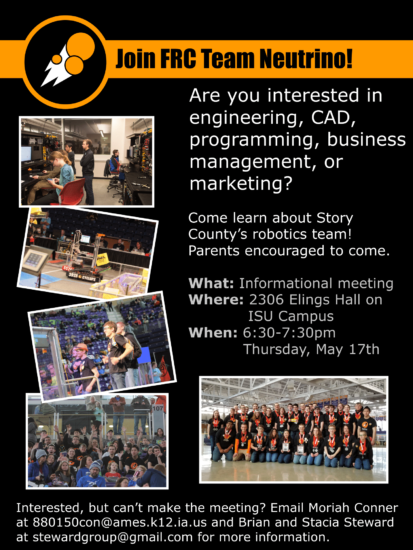 The team invites you to come see it at our annual Robot Reveal event! It will be held on Sunday, February 17th, 6:00-7:00 in Sukup Atrium on ISU Campus. We hope to see you there! This year’s game is Destination: Deep Space, a space themed event commemorating the 50 year anniversary of the moon landing! We made good use of our time on kickoff day, reading through the rules and deciding on strategies. Good luck to all teams competing this season! We’ll see you at the Iowa Regional (Mar. 20-23) and Seven Rivers (Apr. 3-6)! You can watch the game animation here and read the game manual here. Next Friday October 26th, Team Neutrino will be headed to its their final event of the FIRST PowerUp! season, the CowTown ThrowDown! This is the first competition for our 13 new members that will be attending. They’ll soon discover the hardest fun that Dean Kamen totes about. You can see the event website here, and make sure to cheer on the team. A link to the live stream will be coming soon. This has been an amazing season, and to wrap it all up the team put together a video recapping the season. Thanks to everyone for making PowerUp one of the team’s most successful seasons to date! You can find the video here.